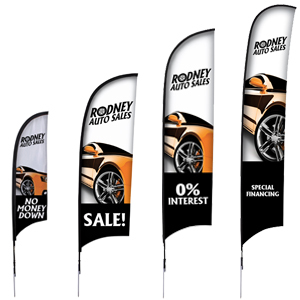 Razor flags are an excellent advertising option for your car dealership. They can be displayed along your property to let customers know that you have a sale, or what your current vehicle options are. Razor Flags Design Templates - Download the Artwork Template to Create your Designs! Razor flags are printed on our mirror fabric, our lightest weight fabric that we offer. All flags are printed using a direct dye sublimation printing process. This means that the ink goes through the fabric rather than sit on top of it. This creates an eye popping display. The flag poles are constructed of a strong but flexible Carbon Composite material that is superior to other poles that have an aluminum base. Our pole hardware is now covered by a lifetime warranty!